Canada’s largest labour union keeps on growing as today we announce our membership has reached 680,000 workers nationwide. “At a time when austerity-driven governments and employers are attacking workers’ wages, benefits, and pensions, more and more Canadians are choosing CUPE to stand up for them,” said CUPE National President Mark Hancock. The latest figures come following a year of organizing successes across the country. 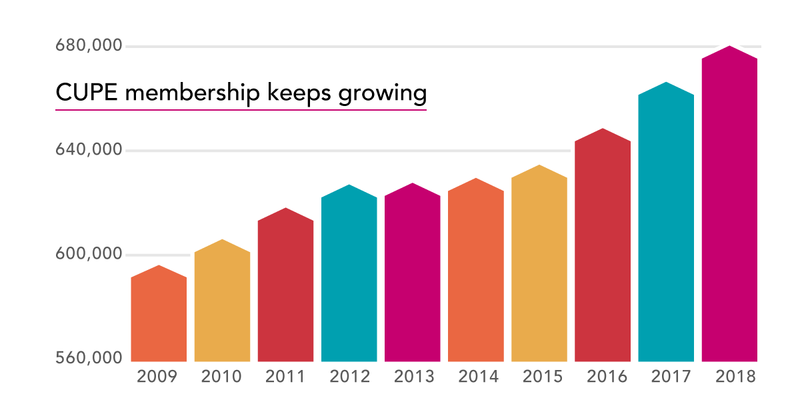 Together in 2018, thanks to the hard work of CUPE staff, member organizers and activists, over 7,800 workers from a diversity of sectors joined the union. There is so much to be proud of. CUPE represents workers in every province, working in sectors like child care, communications, education, emergency and security services, energy, health care, libraries, municipal, post-secondary, social services, and transportation. CUPE was founded in 1963 with 57,000 members.